If you're a regular reader of Niche Pursuits, you know that Spencer recently sold his most successful Amazon FBA brand for $425,000. While we've got other products selling on Amazon, we're looking to reinvest some of that money into trying out new products and brands on Amazon FBA. Part of my role on Spencer's team is coming up with new product ideas and ultimately launching them on Amazon, so I'm excited to tell you all about a tool that has made life a whole lot easier – Helium 10. In this guide, I'll show you exactly how we're using it to find and evaluate new product ideas, conduct keyword research, optimize our listings, and track our success – so hopefully, you can do the same. Use Coupon Code: NICHEPURSUITS10 to get 10% all plans. Or Use Coupon Code: NICHEPURSUITS50 to get 50% off the first month only. I'd like to frame our discussion by first sharing a couple of the biggest challenges many sellers face in 2018 (us included) and then I'll talk about Helium 10 has helped solve them. When private labeling a product, we always suggest that you find some kind of unique angle for your product. This usually means taking a product that exists and doing some new variation of it that stands out from the crowd. However, coming up with that idea and turning it into a product that's profitable is easier said than done. Afterall, there are over 2 million sellers on Amazon and it seems like everything you search for already has a million listings. Sure, you can put a better grip on your new grill brush – but will anybody ever find your product among the thousands of others out there? So finding a product category that isn't totally saturated is certainly a challenge. This is old news by now, but over a year ago Amazon changed the rules about “incentivized reviews.” This meant that as a seller, you could no longer giveaway products in exchange for a review, which was pretty much the go-to strategy whenever you launched a new product. This doesn't mean you can't run promotions and deep discounts for your products, it's a tactic we still use. However, the challenge we always faced was figuring out the right number of giveaways (AKA deeply discounted sales) we needed to do during a launch in order to start ranking for some of our target keywords. Fortunately, Helium 10 has helped us put a system behind our launch strategy so we know about how many units we'd need to giveaway before we ever invest in buying inventory. 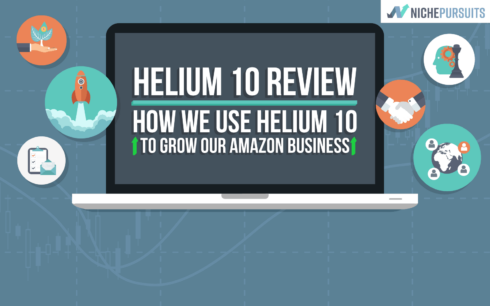 Helium 10 is a software product that includes a suite of tools to help Amazon sellers find product ideas, evaluate the competition, and ultimately track their success in terms of keyword rankings. I think the “10” in Helium 10 was intended to mean it was a suite of 10 tools for Amazon sellers. The problem is, now there are about 13 tools, so maybe we should call it Helium 13? If I had to pick one tool inside of Helium 10 that I couldn't live without, it would definitely be Cerebro. Cerebro does a lot of things, but it's usually where I start looking for potential product ideas. 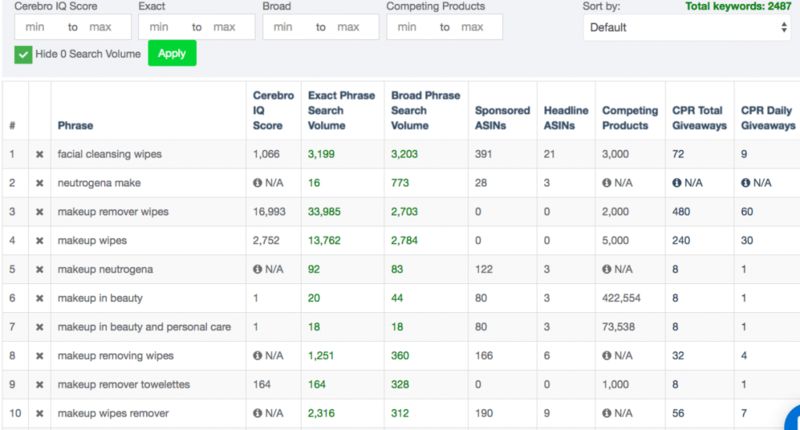 Cerebro does for Amazon what the SEMRush keyword tool does for website owners. You start by pasting in an ASIN of an existing product on Amazon, then Cerebro will pull in all the different keywords the product ranks for on Amazon. 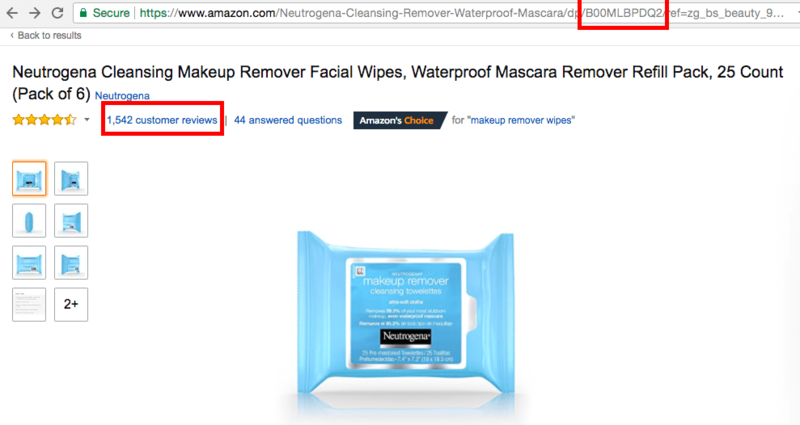 That's right – you can see everything your competitors rank for on Amazon. Notice as highlighted above, the ASIN number you need is always in the Amazon product URL (as well as the product details section). Also, notice that I chose a product with a large amount of reviews. 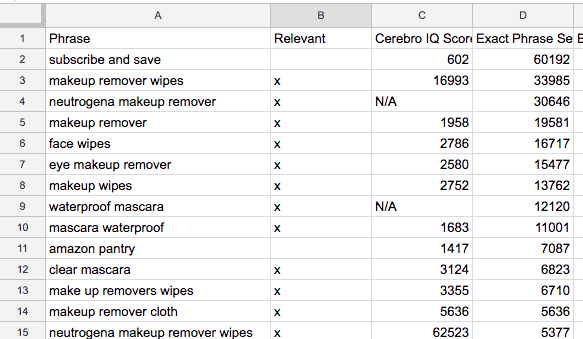 Something I learned early on is that products with a lot of reviews, even if they aren't the top ranked result for “makeup wipes” will usually produce the most keywords in Cerebro because they have likely been on Amazon for a long time. Of course you can run up to 10 Cerebro searches per day, so you can search multiple products – but look for those with the most reviews to maximize your results. You can then sort by the various columns available, and I typically sort by two different columns to find the best results. This is a score based on Helium 10's algorithm that indicates how good of an opportunity there is for a particular keyword. Obviously, I don't know exactly how they calculate this number but it seems that items with a combination of high search volume and few competing products score the highest. This makes sense because if 5,000 people are searching for “peanut butter protein powder” and only a couple hundred products show up on Amazon, that's a good sign. What you'll find is that a number of the keywords aren't relevant to you because they include branded terms. For example, if there is a high IQ score for “Neutrogena Facial Wipes” that doesn't really help me, as I can't use their brand name in my product title. So a human element is needed to sift through these results, but you can really find some golden nuggets using this approach. Amazon doesn't make their search data publicly available, so I'm not exactly sure how Helium 10 gets/estimates these numbers – but it's definitely something different than the Google Keyword Planner volumes you'll find in Long Tail Pro and other keyword research tools. Obviously, with all things being equal, the more search volume a keyword gets, the better. So after going through the highest IQ scores, I next sort by search volume and look through those that have the highest search volume. At this point, I'm looking for potential variations for this type of product that get decent search volume and may be something I can create my own private label version of. When I'm sorting by IQ score and search volume, the first column I'm looking at is the number of competing products. I'll show a detailed example of where this number comes from in a moment, but generally speaking it's how many results show up when you search that keyword on Amazon. This doesn't mean that if there are thousands of competing products you can't do well in that category, but if you find something with less competitors that is typically good thing. This just means that ranking organically should be easier, since you have less products to compete with. Finally, the last column I take note of is the CPR Total Giveaways. The “CPR” stands for “Cerebro Product Rank” formula, which gives you an estimate of how many sales you'd need to make over an 8 day period of time in order to rank on page 1 for that keyword. So as I'm evaluating keywords and product ideas, I can begin to do the math on how many units I'd need to order, how much will it cost me if I am going to sell 480 units at 80% off, etc. in order to make an informed decision on whether I should launch that product. Click here if you want to read a more detailed explanation of the CPR method from Manny Coats. 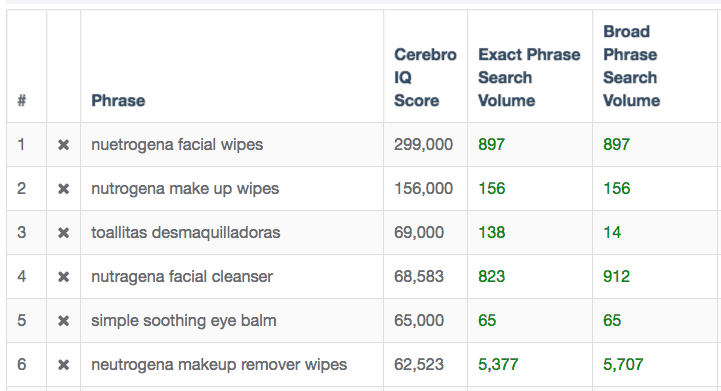 As mentioned, you get 10 Cerebro searches per day, so definitely don't stop at just one product search. 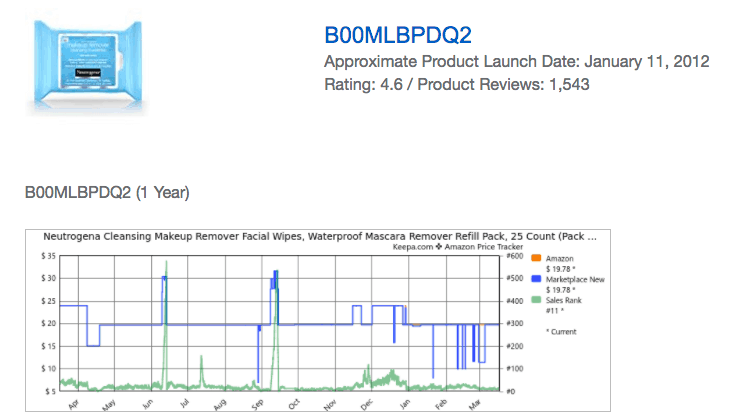 If you're sold on doing makeup wipes, then you can go down the list and put in other popular makeup wipes on Amazon. If you're still not sure exactly what kind of product you want to do, you might want to proceed a little differently. Let Cerebro guide you down some different rabbit holes and see where you end up. If I go back to Amazon and search “clear mascara” I'll get far different results and I can plug one of those into Cerebro and get a whole new set of keywords to comb through. While Helium 10 helps with just about everything that happens before and after, it isn't going to help you find manufacturing costs, get product samples, arrange shipping, and all the other things involved in taking your idea and making it into a profitable reality. Since this post is dedicated to reviewing Helium 10, I won't spend much time on this part of the process. For the remainder of this review, let's assume that the numbers all worked out and we decided to move forward with creating our own brand of makeup removing wipes. Now that you've decided on a product and have it being manufactured, it's time to get your optimized listing ready to go. This is where Helium 10 really shines. The first step is to get a huge list of keywords that you want to rank for. One reason this is so important is because if you are missing a particular keyword in your listing, you WILL NOT get indexed for that keyword on Amazon. Why do I have 1,400 less options? Because those products don't have the word “waterproof” anywhere in their listing so they aren't indexed for that particular keyword. We went from 2,000+ results down to 66 by adding just a couple of modifiers. Hopefully you can see why it's so critical to optimize your product listings with as many related keywords and keyword modifiers as possible. The first thing we do is run another 3 – 5 competing products through Cerebro to squeeze out every possible keyword we can find. You might assume that if I take the top 3 best selling makeup wipes on Amazon that they are all basically ranking for the same things. While there is definitely overlap, you'll find that each one is indexed for keywords that the other 2 are not indexed for. 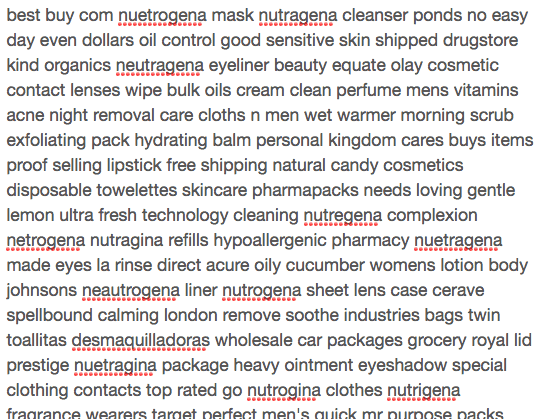 For example, the first Neutrogena search I did gave me about 2,400 results. When I added 2 other products just like it and used Cerebro search history to view all the keywords at once, I ended up with 4,041 keywords. 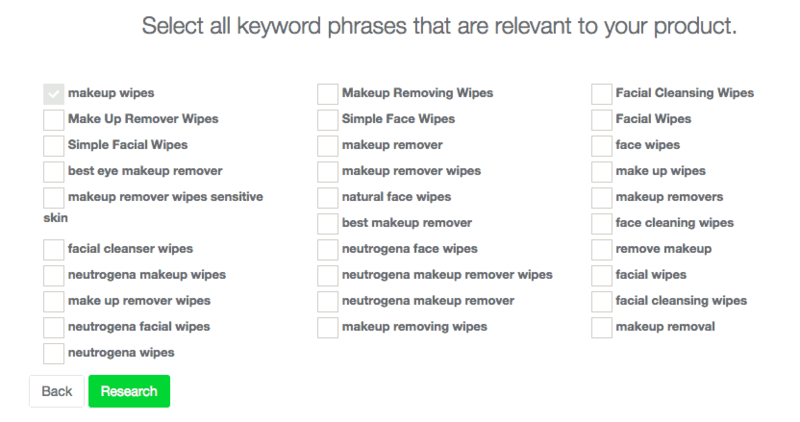 Sure, not all of those 4,000+ keywords are going to be relevant to my makeup wipes – but many of them are. I'll talk about how to sort through them in a minute, but first let's use the Magnet tool to get even more keyword ideas. Magnet in Helium 10 helps you do keyword research by taking your seed keyword and then allowing you to select from a list of related search terms. It then goes to work pulling in a list of keyword ideas that are similar to your original idea, which include the approximately Amazon monthly search volume of each term. Now it's time to sift through all of our keywords and see what is actually relevant to us. I'll admit, this part isn't fun. However, as I showed in the examples above of going from 2,000 product results down to 66 by adding in a couple of keyword modifiers, this step is really important. So now you can take your 4,000+ keywords from Cerebro and the 360+ from Magnet and export them into one spreadsheet. Take some time and go through every idea, highlighting or marking in some way all the of the keywords that are at least somewhat relevant to your product. I usually just add a column to my spreadsheet and type an “x” in that column if it's a relevant keyword. If it's irrelevant, I leave it blank. At this point if it's about cosmetics, makeup, any kind of wipe – I'm going to mark it as loosely relevant. In our next step we'll go further and determine which keywords are the most relevant. Now we're left with only keywords that are at least loosely relevant to our product. From here, what I like to do is score them with a 1 or a 2 – 1 being something that is VERY relevant to my product, and those with a “2” being less relevant. The reason I do this is because I like to get all my #1 keywords into my product title on Amazon if at all possible. Then, everything that is ranked as a “2” is something I'll try to fit into my bullet points, description, or back end keywords on Amazon. Once we know what all of our keywords are, now it's time to return to Helium 10 to clean-up this list. 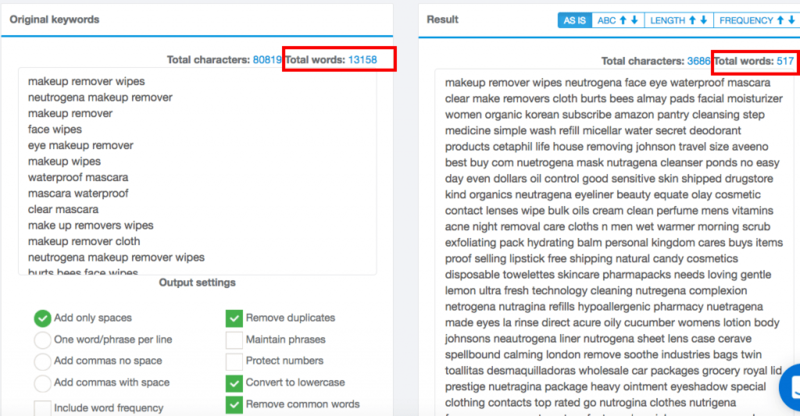 As you might imagine, words like “makeup” “wipes” and several others appear over and over again in a list of 4,000+ keywords. 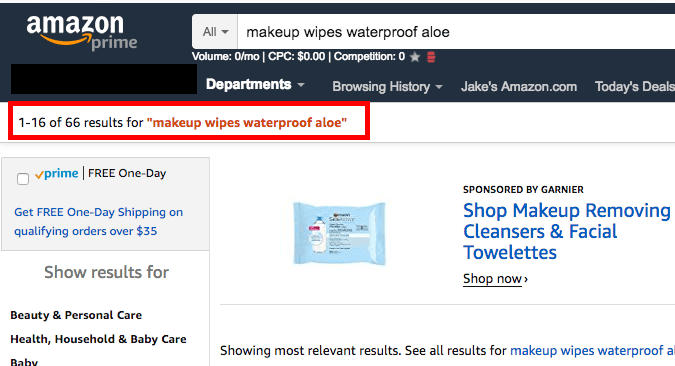 While we want to make sure we use our most important keyword phrases like “makeup remover wipes” just as they appear, other less relevant words like “aloe” “sensitive” really only need to be in our listing once in order to make sure Amazon indexes us for that keyword. We're going to make sure to sprinkle in words like “waterproof” and “aloe” so Amazon will show 67 results once our product is live. Since picking out all these little modifiers in a list of thousands of keywords is quite challenging, we're going to use Frankestein to help. The only setting I changed was checking the box for “remove common words” so things like “the” and “for” are excluded. Notice that I had a total of 13,158 words in my original list and after removing all the duplicate words and common words, I'm left with only 517 words to worry about. If you did a good job with your spreadsheet in the previous step, this should be a list of only relevant words that you want to make sure to have in your listing. This is a tool in Helium 10 that helps you make sure that you don't forget any important keywords in your listing. As you can see, this is an incredibly helpful tool for making sure you don't overlook any important keywords in your listing. 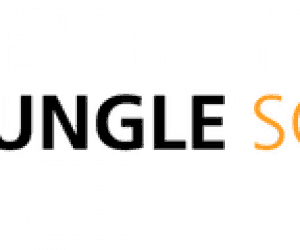 Again, my goal is to fit all of my #1 most important keywords into my title, then anything else in my list I want to work into the description, bullets, or back end keywords (which aren't seen publicly but are seen by Amazon). Once I've created a listing that is using all relevant keywords, I can then go create my listing in Amazon Seller Central and just copy/paste my text from Scribbles into the appropriate fields on Amazon. Now that I've gone through the process of creating my listing and getting my product manufactured and shipped into Amazon, it's important to keep track of how we're doing in terms of keyword ranking. Of course we can do some sponsored listings, but ideally we want to rank organically for a bunch of the keywords we found during our research phase. The Helium 10 Keyword Tracker does what it says – you put in your product ASIN and then your keywords (I usually put in all my #1 keywords) and it will track them for you so you can see where you stand today and where you ranked historically. Again, for the tactical side of improving your ranking, I recommend checking out the CPR method so you know how to successfully launch your product using the Helium 10 tools. What Else Is In Helium 10? There are a total of about 13 different tools in Helium 10, so let me run down each of the different modules and what they can do for you, starting with the newest (and perhaps most exciting) tool. At the time of this writing, Helium 10's latest feature is a new product discovery tool called the Black Box. While I haven't used it much yet, it does have some pretty helpful advanced search features to help you research your ideas and see how well products are selling right now and which way they are trending. I like looking for listings that are performing well but don't necessarily have a high quality listing. There's quite a bit more to the Black Box feature, and it's certainly something we'll be playing around with a little bit more when evaluating new product ideas. From time to time, Amazon fulfillment will lose or damage your products, which entitles you to a refund. While they usually notify you about this and take care of it automatically, sometimes things slip through the cracks – meaning you're entitled to a refund and you may not even realize it. (This is definitely harder to keep track of manually the more you grow your product line). The Refund Genie taps into your Amazon account via API and alerts you to situations where you are likely entitled to a refund. It also has some copy/paste templates you can send to Amazon to start the process, so you can claim all the money you're owed. When you're doing deep discounts via promo codes, there is a gaping hole is how Amazon handles this process. It doesn't prevent people from adding multiple units to their order and applying the discount to all of those units. The inventory protector also uses the API to help you avoid that problem, by setting your maximum order quantity to “1” so people can't take advantage of you. Selling on Amazon has many perks, but there are also a number of crazy things that happen which can make it tough to be successful. One is when you get a listing hijacker. This can take on several forms, but usually it's when some seller claims to sell your product too – so they jump on the listing as a second seller and undercut your price. If you're private labeling a product, this almost always means they are running some kind of scam or selling a counterfeit version of your product. Either way – it's bad news because when a buyer receives their knock-off product, they are going to go back to your listing and leave a 1 star review, and maybe even report it to Amazon – which could harm your reputation. The Hijacker Alert lets you be proactive by notifying you when a new seller shows up on your listing so you can contact them directly and if necessary, contact Amazon to try to avoid further problems. Similar to the hijack alert, the brand gate checker lets you know how vulnerable you are to a potential hijacking. Getting your brand “gated” on Amazon means that nobody can list your products except you (unless they can provide some written proof that they are authorized). There is quite a process to go through to get a brand gated, but it may be worth checking out if you're doing serious amounts of business on Amazon. Misspelled words are a big problem on Amazon, and a great opportunity for savvy sellers. In some cases, Amazon recognizes those misspellings and does an auto-correct. However, there are plenty of times where Amazon doesn't auto-correct the word which means people will likely see far fewer results than they should. Misspellinator takes your keywords and gives you common misspellings and lets you know if it's something that Amazon auto-corrects. If Amazon does not auto-correct it, then that might be an excellent word to add to your backend keywords. The 5K checker helps you make sure that your product is indexed for all the keywords you think it should be. If you went through the process we outlined above, you should be in good shape – but this tool lets you double check and make adjustments as need. Simply type in your ASIN and then your list of keywords and it will check against the Amazon database and report back whether your product shows up for each one of those phrases. We've only being using Helium 10 for a few months now, but it's one of those tools that after you start using it – you wonder how you ever lived without it. If you're already selling on Amazon or are just thinking about getting started – Helium 10 saves a ton of time and takes a bunch of guesswork out of the process you'll go through. I'd be curious to hear about your experiences. Let us know in the comments if you've found other helpful uses for Helium 10 that I didn't cover in this article. What seems to be missing from the CPR giveaways are some options for how high you are wanting to rank. Is their estimate for number of giveaways suggested if you want rank #1? I think market intelligence by viral launch provides much better detail for that and will break down: how many for first page, top 5, top 3 etc. Great overview though. Thanks for taking the time. I’ve been thinking about trying this. Thanks for the thorough review. Good read. I’d love to hear if any of the products you launch using this tool are a hit! I have one winner and it’s a unique product with very little competition. I don’t even run any ppc. I’ve never done giveaways (even when they were still allowed). But I’ve also had some flops. I feel lucky that I have one good one which continues to provide the cash to pay for other attempts. I realized that I was going TOO nichey (yes, nichey). My next product is going to be a tiny bit more competitive.